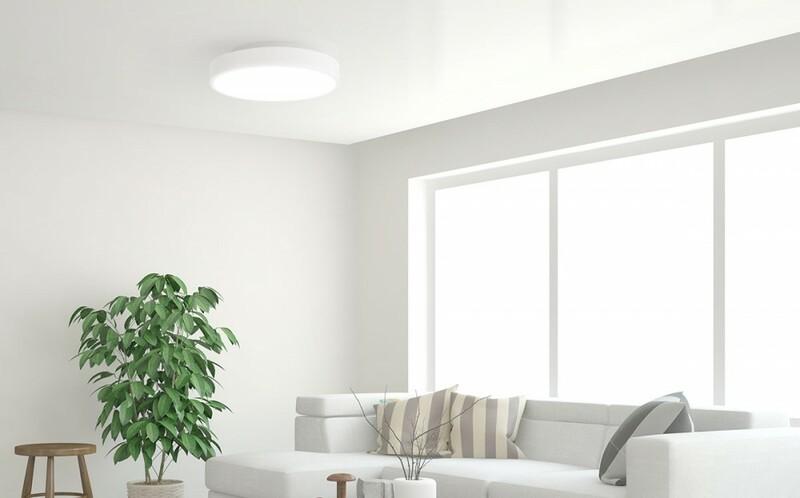 The Yeelight flush mount LED ceiling lights combine cutting edge LED technology, wireless connectivity and intelligent control to create a smart light fixture that provides adaptive lighting personalized to your home's needs. The exquisitely fabricated flush mount light with a universally appealing design offers a contemporary minimalist aesthetic that makes it a great addition to living rooms, bedrooms, hallways, dining rooms, offices, utility work areas, stairways and more. The Yeelight ceiling light conveys simple refinement with flair and brings a splash of understated look that blends into any building interior as it illuminates any space. 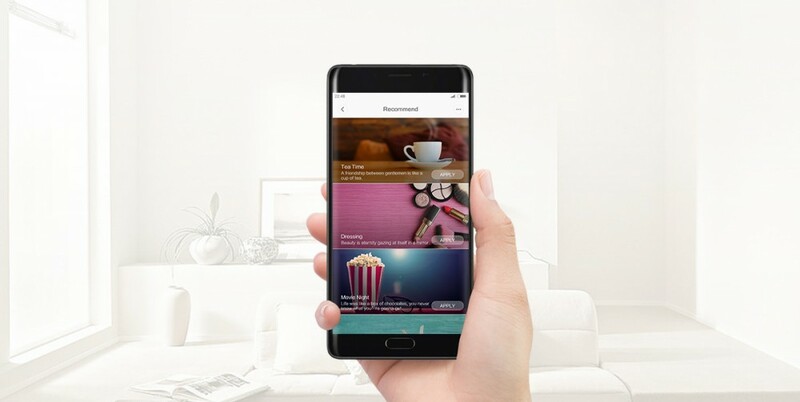 With its capability to customize all of your daily routines into moments you can enjoy, Yeelight lamps possess an incomparable sophistication that allows lighting customization from anywhere in the world with an active Internet connection. The 12.6 inch ceiling light provides powerful, energy-efficient illumination with a brightness of 1800 lumens while consuming as little as 28 watts. The Yeelight ceiling light delivers superior light quality and industry-leading efficacy from an array of 240 Osram LEDs which are mounted to a metal‑core printed circuit board (MCPCB) for optimum illumination. The high flux density light sources produce superior quality of light through a heat and impact resistant acrylic diffuser which soften high intensity LED pixels to create smooth and uniform light emissions with excellent glare control, minimal scattering loss, and high transmission efficiency. The SMD LED packages are soldered to the thermally efficient MCPCB to form high reliability, high operating temperature capable interconnects with exceptional thermal fatigue, creep and vibration resistance. Excellent solder joint performance combined with a high thermal conductivity multilayer circuit board facilitates excellent thermal management of LED junction temperature, thereby ensuring optimal LED performance over the product's long rated life. Yeelight LED ceiling lights are designed to enable better vision and unlock a number of positive health effects. The light casts a pool of soft light that renders colors and whites perfectly across a wide range of correlated color temperatures (CCTs). With a high 95 CRI (color rendering index), Yeelight lamps bring out more vibrant colors and make whites appear naturally brilliant and vivid. Good color reproduction is critical in visually demanding applications. This high spectral quality ensures a high level of visual comfort. Yeelight offers you the ability to customize CCT to your personal preference and create an environment that corresponds to the body’s daily rhythmic changes. Tunable-white light sources allow smooth adjustment between the limits of extremely cool temperature (6500K) to extremely warm temperature (2700K). Light profoundly influences our circadian rhythms, mood, and cognition. With tunable whites, Yeelight provides biologically effective lighting that allows you to create a relaxing ambiance with low CCT light and enhance concentration with higher CCT light. Yeelight supports deep dimming which allows the intensity to be dimmed from 100% to as low as 0.1 lumen. The combination of CCT tuning and deep dimming makes it possible to implement human centric lighting in harmony with the Earth's natural lighting cycle, e.g. improving sleep quality by stimulating the release of the sleep hormone melatonin with the lowest intensity moonlight, or simulating daylight with full output to increase productivity. 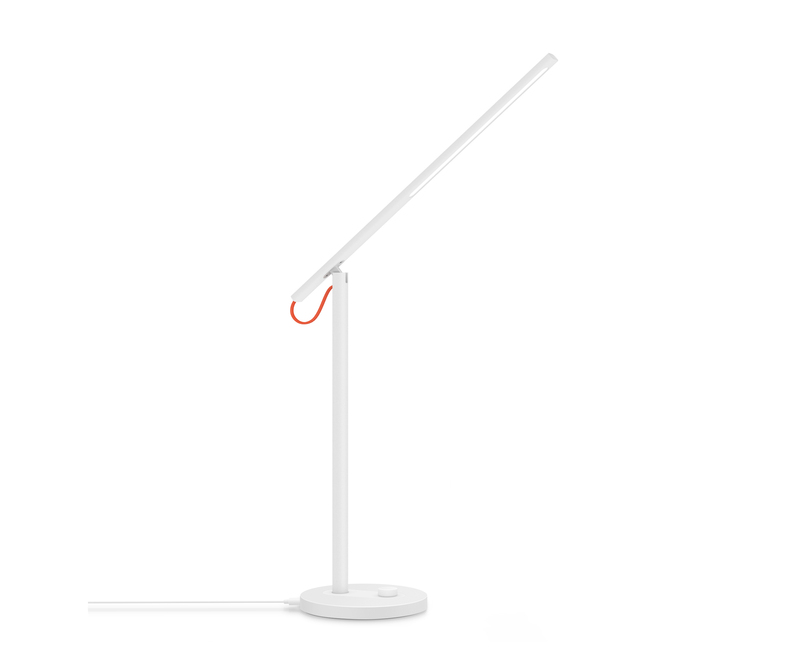 This lamp is equipped with wireless communication modules to support its robust Internet connectivity and remote control. 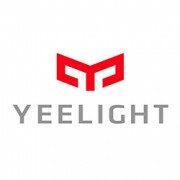 The Yeelight app which is available for both iOS and Android devices allows you to control a single lamp, or group lamps and control them together via Wi-Fi connection. You can turn on/off or dim the light, set schedules and timer, and create scenes from your phone or tablet anywhere in the world. You can also pair a voice assistant such as Amazon Alexa or Google Assistant for hands-free lighting control. 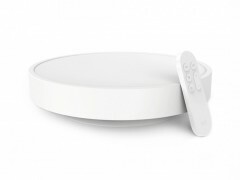 The smart ceiling light also works with IFTTT (If This Then That), a popular trigger-action programming platform whose applets create automated interactions between web services and IoT devices. The light comes with a Bluetooth remote control that provides the basic level on/off and dimming control, offering added convenience for lighting control. Yeelight LED ceiling lights are built not only with light quality and smart control that exceed most competitors' products, but also with value-packed design and rigorous engineering that consistently outperform and outlast the competition. Superior thermal management mitigates the negative effects of thermal stress on component life as well as LED light output and color stability. Reliability and efficiency oriented circuit design enables exceptional line and load regulation with optimal output characteristics matching the long lifetime of the LEDs. The constant driver generates minimal ripples in the output current, which ensures flicker-free operation, and the reliability, longevity, and lumen output of the LEDs. Innovative industrial design gives Yeelight ceiling lights unmatched ease of installation and maintenance. The product is engineered to provide complete dust resistance, which eliminating the concern of dirt accumulation and insect ingress. Sleek minimalist design offers a perfect complement to a wide range of contemporary decor. High quality PMMA diffuser with evenly scattered penetration eliminates glare from every angle of view. Exceptional color rendering (95 CRI) brings out the vibrant colors, patterns and textures. Advanced thermal engineering minimizes thermally induced stresses into the diodes and prevent premature phosphor degradation. High performance LED driver provides excellent load regulation with low total harmonic distortion (THD) and a high power factor (PF). App-controlled remote access, color temperature tuning, brightness adjustment, automated scheduling via Wi-Fi. 0.1 - 1800 lm deep dimming and full range CCT tuning bring the rhythm of nature indoors. Supports voice control with Amazon Alexa and Google Home.